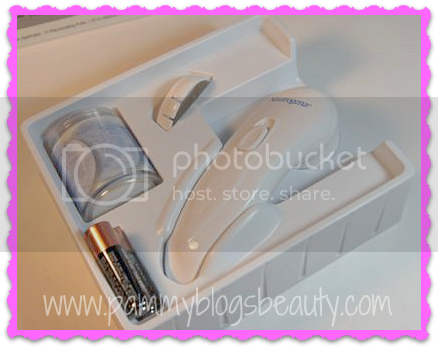 Pammy Blogs Beauty: Get Smooth Skin with Neutrogena's Microdermabrasion System: Love this kit! Get Smooth Skin with Neutrogena's Microdermabrasion System: Love this kit! My skin loves exfoliation! For years it was the "missing link" in my skincare routine. Once I realized that good exfoliation was what my skin needed, I was hooked! 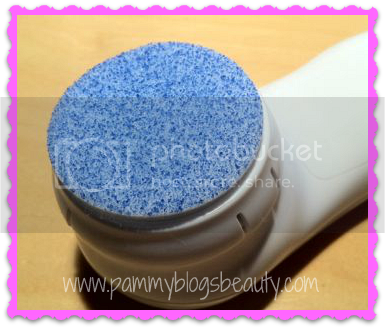 This new device from Neutrogena is a great way to get some good mechanical exfoliation! This new system from Neutrogena is not "true" Microdermabrasion. True Microdermabrasion is really something much deeper: Typically it involves using aluminum oxide crystals to remove dead skin cells and a suction to vacuum those away. Many at-home exfoliants now use the term "Microdermabrasion" to describe basic exfoliation. What this device from Neutrogena gives you is deep cleansing with exfoliation. While it is not technically microdermabrasion, the device still does great things for your skin! I know enough about Microdermabrasion that I honestly didn't expect this device to be "real" microderm (I wouldn't imagine that any home kit would be able to deliver Dr. office type Microderm results). So, this is not a let down for me. But, just know, you are really just getting exfoliation with this system, not microderm. I have normal-dry/combo skin. In the Summer months I lean more towards normal (and even normal-oily in t-zone) and in the Winter months, I lean more towards normal-dry. My skin is generally really clear, but I do get the occasional clogged pore on my chin. No major lines or wrinkles yet for me. But, as i am in my late 30's, I am trying to do everything that I can to prevent these. I have some very fine lines around the eye area (that are especially noticeable when my skin is dehydrated). My biggest concern seems to be that my skin is very sensitive. I always need to proceed with caution when trying new skincare. 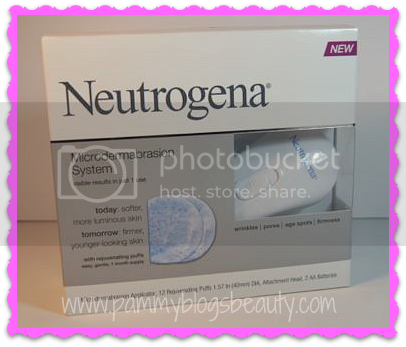 To find out how I like Neutrogena's Microdermabrasion System kit, keep reading after the page break. This kit includes the device and a 1-month supply of the rejuvenating puffs. The kit retails for about $19.99. The kit contains the handheld applicator, 12 Rejuvenating Puffs, and 2 batteries. The refills for this kit retail for about $12.99. So, the device itself is basically a hand held vibrating applicator with a cap that attaches to the disposable puffs. The applicator cap has a velcro like texture that the pads actually stick to. The little disposable puffs are basically mini "buff puffs". They are little thin round exfoliating puffs that are pre-soaked in cleanser that contains ultra-fine crystals. When you wet them the cleanser is activated. So, you get cleansing and exfoliation in one step. According to the packaging, this kit gives more luminous skin immediately and promises firmer/younger looking skin in the long-term. Apparently the use of the vibrating device with the pads boosts surface skin cell turnover and reveals firmer younger-looking skin. Neutrogena recommends using 3 times per week. This is exactly how I use it. I use device after cleansing your skin. The puff actually has cleanser in it. So, I suppose that you could skip cleansing and just use the system; but, I just like to wash my face first. After I rinse, I keep my face wet. Then I use the device. Using the device is super-duper easy! You just attach the Rejuvenating Puff to the cap. You then wet the puff (to activate the cleanser) and then pop it onto the battery operated applicator device. The device has an on/off switch and 2 vibrating speeds. I just turn it on (to the low speed) and gently move the device in a circular type motion across my face avoiding the eye area. I really enjoy the feel of the vibration combined with the exfolation from the puff. After drying my face, I smooth on a moisturizer. I really love the feel of using this device! It gives me some really great exfolation without irritating my sensitive skin. No, it is not professional Microdermabrasion; but, I still love the results. However, if you are looking for professional Microdermabrasion, it is still best for you to get that from your Dermatologist or trusted Aestheticism. After use, my skin does look slightly more pink. But, that is just temporary. My skin feels incredibly smooth after use. This is especially noticeable when I wake up in the mornings after using the device the evening before. 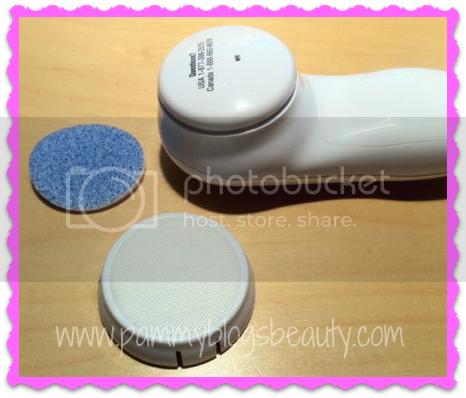 My skin feels amazingly smooth from using this device! I used this device as directed for one full month. I feel that the good exfolation from this device allows my moisturizer and treatment products to sink in better. Also, it seems as if some slight dark spots on my skin have started to fade a bit (these were leftover from pregnancy and not very noticeable). Also, it seems as if my fine lines are a bit less apparent. Since lack of firmness is not an issue for me, I can't tell you if this product helps for that. I love, love, love that the puff is a single-use disposable puff! This means that there will be not bacteria from reintroducing the same puff to your face again. It really is a genius idea how the puff sticks on the machine with a velcro-like attachment. I really love using Neutrogena's Microdermabrasion System! It is exfolation that I am comfortable with using at home! Many home "Microdermabrasion" kits kinda scare/intimidate me; but, not this one! For my sensitive skin, this kit is a winner. I am looking forward to getting some refills and continuing to use this kit!